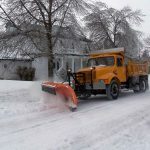 The Breckenridge Street Department is asking residents to be advised that with the winter storm forecast for the next couple of days, the department may be out plowing the snow off of the streets. Friday starting at 3 a.m.
As of April 1st parking on the city streets has been allowed. However; if you are able to park anywhere other than on the street, it would allow the plows to remove the snow in a timely manner.